In this paper we look at a panel of OECD aggregate fertility and labor market data between 1970 and 1995 and we report some striking recent developments. Total Fertility Rates (TFR) were falling and Female Participation Rates (FPR) were increasing, conforming to a well known long-run trend. Along the cross-sectional dimension, the correlation between TFR and FPR was negative and significant during the 1970's and up to the early 1980's. This seemed consistent with secular comovements. However, by the late 1980's the correlation had become positive and equally significant. 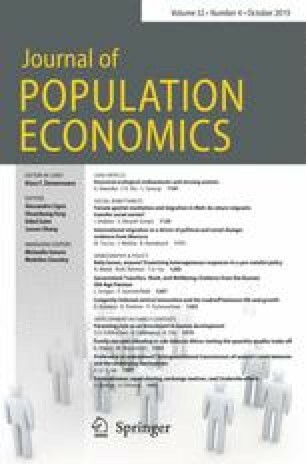 We discuss our findings within the framework of standard neoclassical models of fertility and labor supply adapted to macro data, as in Butz and Ward (1979). All correspondence to Pedro Mira. Namkee Ahn is grateful for financial support received from the Bank of Spain and from Spain's Ministerio de Educación y Cultura, grant SEC97-1249. We benefited from comments by two anonymous referees and by seminar participants at FEDEA, CEMFI and ESPE-98. All remaining errors are our own. Responsible editor: John F. Ermisch.